I love video games that make physics phun! 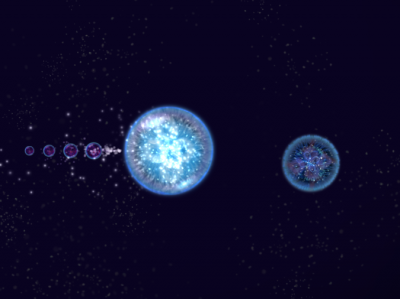 There is no better physics video game than Osmos, the 2010 iPad Game of the Year. After becoming enthralled with the game, I wrote a blog post about how you could use it in the physics classroom. A few weeks later, the makers of the game contacted me! They were super cool, and we had several extended conversations of physics, education, and video game development – it was awesome! Ultimately, we decided to run a “Physics of Osmos” contest in the winter of 2012. It was a great success, and a deserving high school student won a new iPad for his great submission. In 2014, I wrote up a formal article on the way-cool physics of the game. After a few years of being lost in an abandoned email account, the article was eventually published in the peer-reviewed journal, The Physics Teacher. You can download and read the full article here.